Japan’s Hokuriku Region stretches along the northwestern shores of Honshu Island, an area that combines the high peaks of the Japanese Alps and a long coastline along the Sea of Japan known for its fine seafood. On March 14 it will become a lot easier for travelers to explore this region when the Hokuriku Shinkansen service begins running its 2.5 hour service from Tokyo. This new $17.5 billion Bullet Train service to Hokuriku is a fitting engineering achievement to mark the 50th Anniversary Year of the Shinkansen (Bullet Trains) and should serve as a reminder that high speed rail has been an enormous factor in Japan’s rise to economic power, an ascent that totally parallels the spreading network of Bullet Trains throughout the country. The new line that opens this spring runs from Nagano Station to Kanazawa Station and it couldn’t come at a better time for Japan’s fortunes in the U.S. tourism market, a market that seems to be discovering the beauty of rail travel and the beauty of Japan at the same time. The strength of the U.S. Dollar, which now buys 118 Yen, is a major factor in the surge of tourism. In September 2012 the Yen was roaring at 77 Yen to the greenback. That huge increase in spending power has U.S. travelers reaching into their bucket list and pulling out Japan. To put that all in perspective, when the new Hokuriku line makes its initial run, it will be just three years and three days after the March 11, 2011 earthquake/tsunami that completely devastated Japanese inbound tourism. The new train’s straight track to Kanazawa is a real contrast to the roller coaster that Japanese tourism has been riding in the new millennium. The ease of access to Hokuriku comes at an ideal time. Until now, Hokuriku required a five-hour journey with the sort of train changes that can be confusing for many travelers. 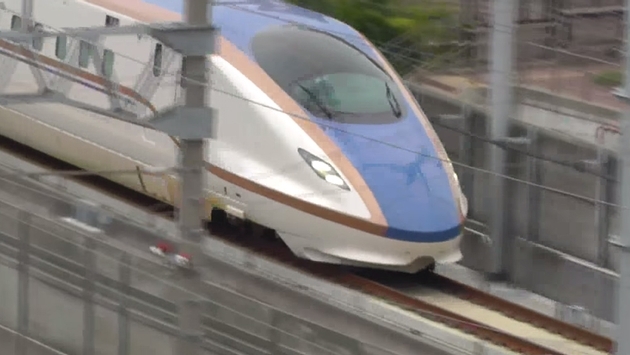 The new extended Shinkansen line will run through the toughest routes across the Japan Alps. It’s the difficulty of access that has protected the region’s traditional nature from too much outside influence. Those Alps and the coastal region on the Japan Sea give Hokuriku a fine combination of traditional and remote mountain village culture and a more international mindset of the region’s ports. The sea there also provides what most Japanese consider the country’s best seafood. To help the new train and the Hokuriku region take off, the JNTO launched a Hokuriku website detailing attractions, landmarks, and culinary destinations and a map for international travelers. The site should come in handy for the expected growth of tourist traffic to the region. For now the train’s western terminus will be in Kanazawa, the largest city in Hokuriku. The city’s highlight attractions include Kenroku-en Garden and the city’s historic Higashi-Chaya District. 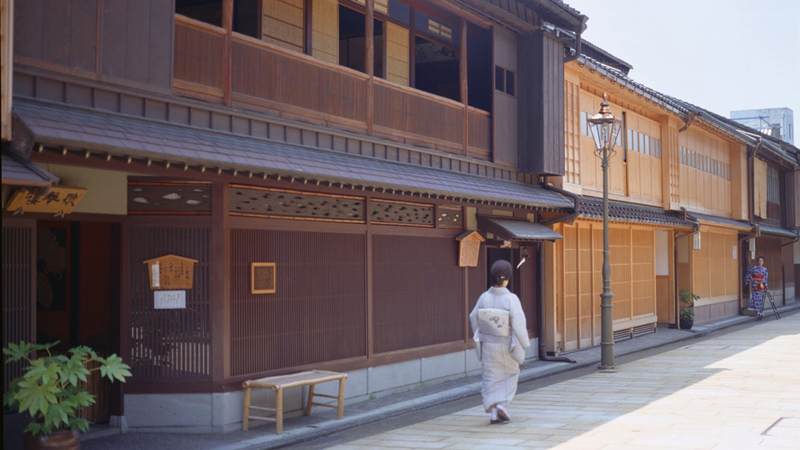 Kanazawa was a center for the second most powerful family during Japan’s Edo period, the Maeda family. Though the Tokugawa Shogunate ruled from Edo (modern day Tokyo), the Maedas oversaw their lands from Kanazawa. Their influence spawned the city’s oft-cited feeling of time travel to the feudal era. The patronage of the Maeda family helped establish many of the crafts that define the area today. While such traditional crafts as lacquer ware, pottery and copper are abundant, a contemporary art scene is also thriving. Food traditions include the seafood cuisine, quality sake and breweries producing miso and soy sauce. Other stops between Nagano and Kanazawa also offer visitors some interesting attractions. Myoko is a gateway to some of Japan’s finest alpine places such as Echigo-Tsumari, a popular hot springs town. It’s also an arts center thanks in part to the Echigo-Tsumari Art Field, which hosts international art events every year, as well as a Triennial. The new Jo Etsu-Nyoko station that was built for the new train is very near Nozawa Onsen, a great ski gateway that made No. 41 on the New York Times Best Places list in January. The train departs Tokyo from the classic Tokyo Station, a 1914 landmark that completed a $645 million renovation in 2013. A top tourist attraction itself, the station is known for its concourses lined with restaurants, stores and a 100-year-old refurbished hotel. The station is the city’s main bullet-train hub and handles about 380,000 mainline train passengers a day.